Skin tag: what is it? A benign, soft hanging piece of skin which most people have at some point in their lives. It generally causes no pain and is usually removed for aesthetic or cosmetic reasons. (i.e. All those at risk for diabetes and cardiovascular disease. A skin tag is removed by disconnecting the blood supply quickly and efficiently without anesthesia. Larger growths may require local anesthesia. Removing skin tags: How are they removed? Burned off using light electrical current (cauterization)-easiest way. At Nell Laser Clinic, Nell also does facial mole removal. Not always brown, age spots can be grey or black as well. They are sometimes known as liver spots, senile lentigo, solar lentigines, or sun spots because they are caused by many years of sun exposure or the use of tanning beds. Although melanin helps protect the deeper layers of the skin from UV rays, it can be produced in high concentrations or become “clumped”, thus causing age spots. These spots are not dangerous and can easily be removed. Soft and yellowish, usually found around the eyelids. Fat deposits underneath the skin. 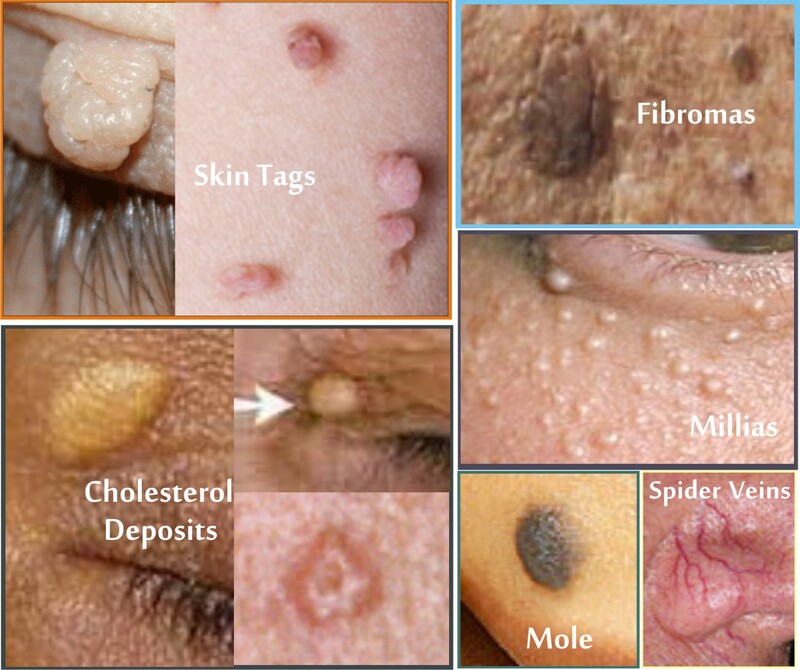 Also known as a fibroid tumor, or fibroid, but they are non-malignant moles and can be easily removed. Anyone, but more prevalent in African-Americans. Also known as “seborrheic verruca” or “senile wart” because it resembles melanoma skin cancer or a wart. It is, however, a benign skin lesion. Ranges from light tan to black; round or oval; flat or elevated; very small to more than 2.5cm (1 inch). A wart is a growth of skin caused by human papillomavirus (HPV), a virus which enters the body usually in an area of broken skin. The virus causes the layer of skin on top to grow quickly, thus forming a wart. The dark spots seen in a wart are tiny blood vessels that supply the wart with blood. Warts can grow on any part of the body. Commom warts often grow on the hands, but can grow virtually anywhere. Plantar warts grow on the soles of the feet and can be painful because it is a pressure point. When does a milium occur? When dead skin or oil is trapped in a pore or pocket and becomes covered by a layer of skin.